Makhundlu in Swaziland’s Lowveld region is often drought-stricken with smallholder farmers dependent on external food aid. The low quality of the land means growing crops can be tough and food security is extremely volatile. In response, the Ministry of Agriculture and the Ministry of Tinkhundla (Swazi term for traditional leadership) and Regional Development worked together to design the Lower Usuthu Sustainable Land Management Project (LUSLMP), also referred to as LUSIP-GEF. The project is financed by the International Fund for Agricultural Development (IFAD) and the Global Environment Facility (GEF), and implemented by the Ministry of Agriculture and the Swaziland Water and Agricultural Development Enterprise. In Makhundlu water is a very precious natural resource. The closest supply is six kilometres away and only provides enough for domestic use, so growing crops or tending to livestock can be incredibly challenging. The project targeted family farmers in the area who were most affected by the lack of water (mostly women) and help improve their food security. It provided the farmers with the tools and workshops necessary to cultivate permaculture gardens and adopt rainwater harvesting methods. Permaculture gardens involve incorporating wood ash and manure into the soil when it is tilled. This improves the soil's ability to retain water, increases its fertility and stops pest infestations. Then a 5-10 cm layer of mulch (dried grass or leaves) is applied which keeps moisture in the soil, regulates soil temperature, suppresses weeds and reduces soil erosion during the heavy rains. After this a variety of seeds are planted from leaf and root vegetables that are mixed together to reduce pests and diseases. The crops are watered three times a week around the base of the stems to conserve as much water as possible. Two weeks after planting a liquid fertiliser of water mixed with manure is applied. Organic anti-pest sprays are used, made from ingredients such as aloe and lemongrass. The farmers learned about the principles of permaculture from workshops and demonstrations. 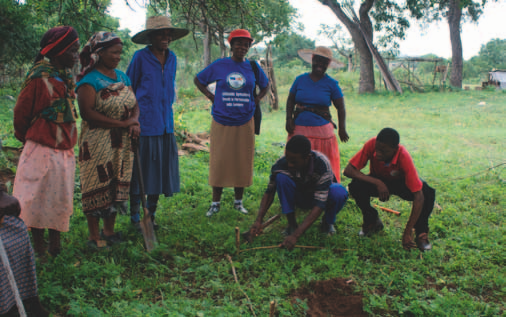 Of the 44 farmers that were trained, 41 went on to start their own permaculture gardens which they organised in groups to provide each other with support and advice. The project provided each farmer with a starter pack of mixed seeds to begin their permaculture. Project staff made frequent visits to answer questions or provide any help the farmers might need. They also organised farmer learning exchange visits where farmers shared experiences, skills, challenges and solutions. 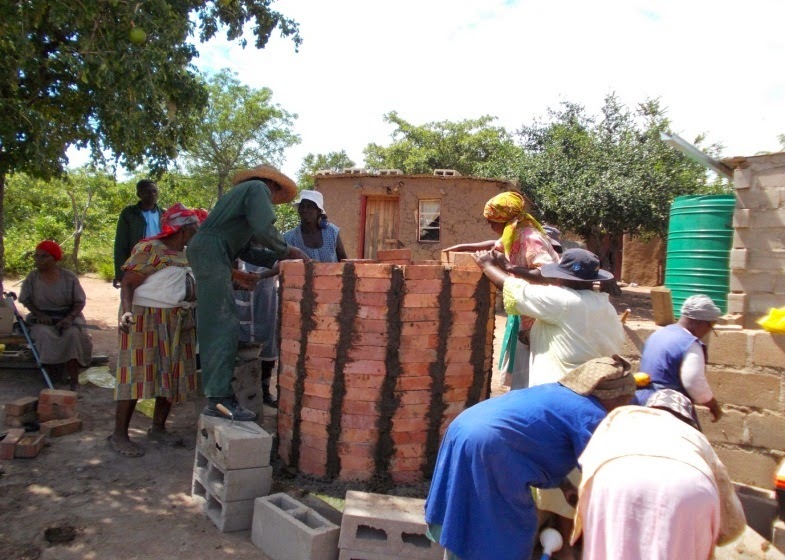 As well as the permaculture starter pack, the farmers were given training and materials to build their own rainwater harvesting tanks. This means that they have clean water which they can use to water their gardens. The 41 farmers who participated in the project have benefitted in many ways. They now have fresh vegetables free from synthetic chemicals, fresh water and have created strong bonds in the community by working together. The cost of vegetable production has decreased and the farmers no longer have to go and fetch water from the borehole during the rainy season. However, there were some initial challenges to the project. The first stage of a permaculture garden is particularly labour intensive which the farmers found hard to accept. Also during summer there is a lot of work in the maize fields so most farmers prioritise their work on the fields and neglect their gardens. However, overall the project managed to overcome these issues. 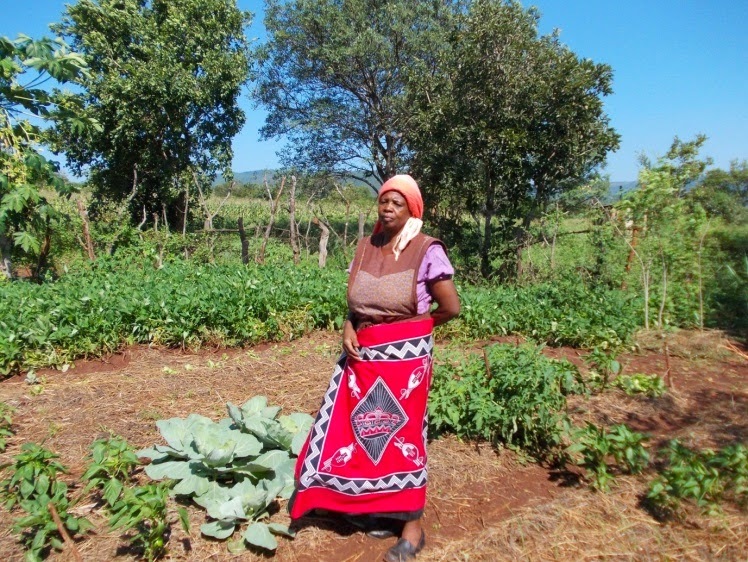 Agnes Mangwe, a farmer from Vikizijula in Makhundlu now has a permaculture garden and sells lettuce from it to pay for her grand-children's school fees. The key to this project's success was the willingness of the community to teach each other and work as a team. Farmers told us they appreciated the continued collaboration with the project staff, but were now able to make their own way. This is what has made the project approachable and sustainable. Since this initial training in 2011, more than 500 permaculture gardens and 700 rainwater harvesting tanks have been established in the project area. 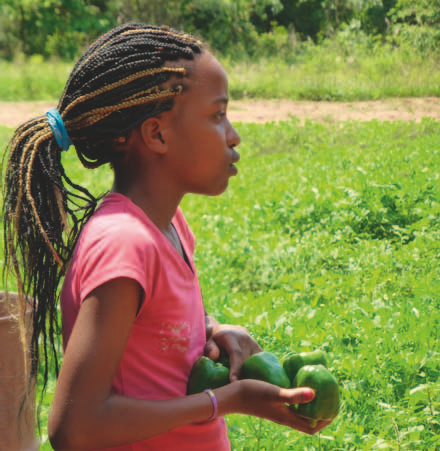 A further 100 gardens have been constructed in the peri-urban communities of Manzini and Mbabanes. In addition the project has trained primary school teachers to introduce Permaculture into the school curriculum and at national level to the National Curriculum Centre.